Tsavorite is one of two green varieties of garnet, though arguably the more important of the two. Especially in smaller sizes, tsavorite creates competition for emerald because it is less included, rarely treated and more durable. Like some emerald and green tourmaline, tsavorite garnet owes its green hues to the presence of vanadium and chromium. First discovered in Tanzania in 1967 and a few years later in Kenya, tsavorite's name pays homage to the nearby Tsavo National Park. Tsavorite is a variety characterized by a medium to dark green or yellowish green body color. 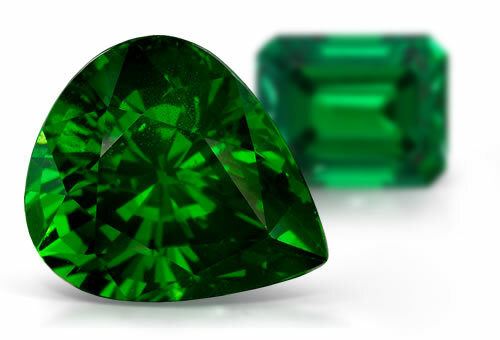 Tsavorite garnet is a Type II clarity stone. Stones will sometimes have feathers, fingerprint inclusions, needles, asbestos fibers and small graphite platelets.